Android app WhatsApp new update was released once again and this time it is only available on Google Play Beta channel. This new update features the first camera app has changed. 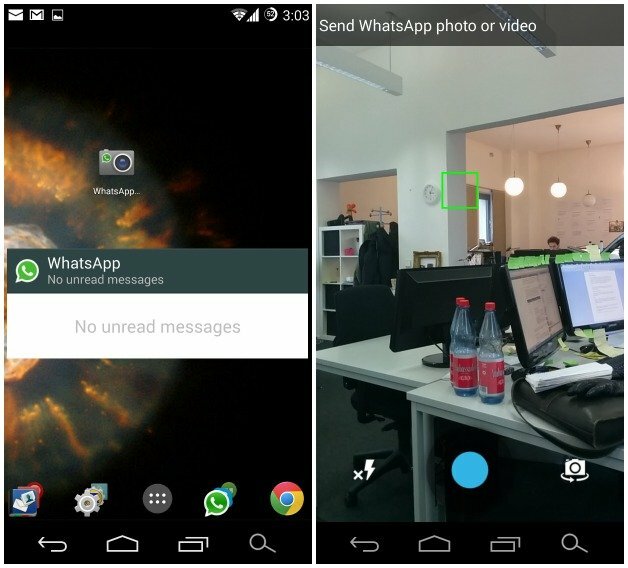 The Android Police reports, according to the Messenger Whatsap inbuilt camera feature complete with a new user interface and the icon has changed. Large blue color white color instead of the shutter button has been replaced with large buttons. New icon for the flash and the camera switch button can be seen. The old version of WhatsApp or photos while shooting a video screen above 'Send to (contact name)' 'that appear on the new version completely got rid of the box. In addition to record a video the user is also given to the slightest details. Now the user to record video of White color will keep pressing the shutter button to start recording video, as well as will be red. Video recording can be stopped by removing the hand from the button. Photo and video sharing interface is also slightly changed. Large round 'send' and 'Cancel' button is now a teal-colored 'send' button has been replaced. One button is also evident in our regular chat window.WhatsApp user to cancel the display in the top left corner will have to use the back button.Caption box has been removed from the photo below right now to see the whole picture. This new update of WhatsApp now on Google Play is not available for regular users. However, the beta tester for the new feature App version 2.16.4 and 2.16.5 can download. With this updated app from Google Play can also be downloaded as OTA.